The first round of the NCAA Tournament is in the books. The second round is on tap. So Matt Norlander and I got together in the middle of the night -- at around 1:30 a.m. ET on Saturday -- to record an episode of the CBS Sports Eye On College Basketball Podcast that looks both back and ahead. We took it regional by regional. OPEN: We discuss the West Regional -- where Murray State's Ja Morant is the story, where Syracuse ended a fourth straight season with at least 14 losses, where Nevada's season ended early, and where Buffalo vs. Texas Tech should be tremendous. 22:00: We discuss the East Regional -- where Maryland ended Belmont's season, where Richard Pitino got a win over Louisville, where Virginia Tech is just a victory over Liberty away from the Sweet 16, and where Duke-UCF is interesting because of the presence of Zion Williamson and Tacko Fall. 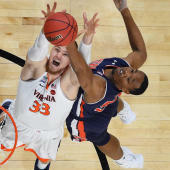 34:00: We discuss the South Regional -- where Virginia trailed at the half in another game against a No. 16 seed, where UC Irvine upset Kansas State, where Cincinnati lost early again, and where Admiral Schofield hit some big shots late to lift Tennessee past Colgate. 46:00: We discuss the Midwest Regional -- where North Carolina trailed at the half before rallying to beat Iona, where Auburn-New Mexico State was wild, where Chris Holtmann somehow got Ohio State into the second round of the NCAA Tournament, and where Wofford-Kentucky should be awesome.